A year and a half ago I got Netflix only because I had heard good things about Stranger Things. As probably many of us I was baffled and amazed by the appearance of an original Grenadier monster used by the kids playing D&D. The miniature was sculpted in the 1980's by John Dennett for Grenadier Models Inc. It's called a demon for the Fantasy Lords series but it clearly is a two headed, tentacled Demogorgon. The whole appearance of this miniature in the TV show is actually an anachronism: the first episode of the series is set in November 1983, while the miniature has the year 1984 inscribed on it's base. Mirliton in Italy has all the old Grenadier figs so I ordered three of them immediately. Two got seized by my daughters though. 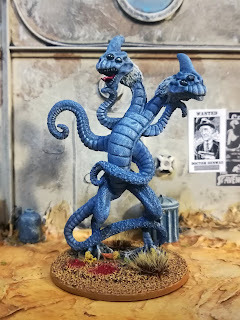 Of course this is a vintage Gary Gygax D&D monstrousity, but if Rick Priestly can retrofit an Umberhulk in Rogue Trader and call it an Ambull, I can upside-down a Demogorgon and call it a Warp entity. 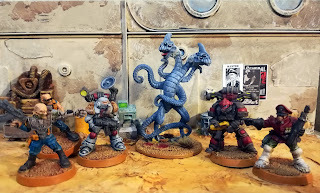 Awesome job on a classic miniature - and a great way to use it in sci-fi! Quite nice indeed, I like what you did here. Terrified me in my AD&D days and with your work still does!